What is a distal radius fracture? A distal radius fracture, sometimes called a “broken wrist,” is a common wrist injury. This type of fracture can occur from a variety of trauma, ranging from a fall at home to a major motor vehicle collision. The distal radius is the portion of the radius bone just below the wrist joint. As we age, the bone of the distal radius loses bone mass and becomes more prone to fracture, particularly in post-menopausal women and people with osteoporosis. 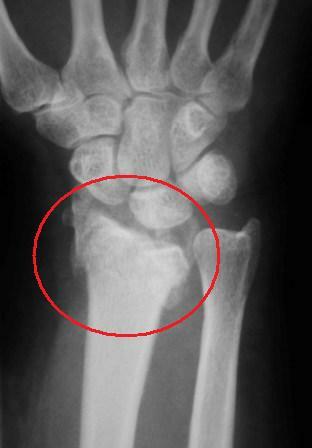 The distal radius may fracture as a result of a slip and fall in these cases. Younger patients with stronger bones may break the distal radius after high-energy trauma, such as a sports injury or car accident. In most cases, restoring the function of the hand, wrist and forearm is dependent on satisfactory healing of this injury. Treatment depends on the severity of the fracture as noted on the x-rays and the patient’s health, activity level, and desires. The distal radius reliably heals after a fracture; the main question is whether it will heal in a functional position. Many people have fractures which are well-aligned, and, therefore, do not require surgery. Treatment in these cases is typically protection in a cast or brace for several weeks. Follow-up x-rays are obtained in clinic to evaluate how the fracture is healing. Some patients have displaced fractures which can be re-aligned without surgery and placed into a splint. This is called “closed reduction” and is performed either in the office or emergency room using an injection of a local anesthetic. After the broken bones are “set,” a plaster splint is molded to the wrist and forearm to maintain the alignment. After a few weeks, the patient can often be placed into a lighter cast or custom splint. Waterproof casts are available at the Raleigh Hand Center. Some patients have fractures which are more severe and the alignment of the fracture is not satisfactory. Surgery may be advised to improve the alignment of the bones. What is involved with surgery? Surgery does not really “heal” the fracture; it simply allows the bones to be held in good alignment while the body bridges the fracture site with new bone. This healing process takes 6-8 weeks. Rest and elevation of the hand to the level of the heart is very import for the first few days after surgery to reduce swelling. Finger and thumb range of motion exercises are encouraged to help prevent stiffness. The first few days after surgery can be painful, and pain medications will be prescribed to help. These should be weaned as the pain improves over time. Your wrist and possibly elbow will be protected in a plaster splint which will be removed in clinic along with the skin sutures at about 10-14 days. At this point, many patients can begin gentle wrist range of motion and light use with the hand. However, some patients need an additional few weeks of casting to protect the repair, depending on the severity of the fracture. It is typically recommend that patients avoid heavy use of the hand until about 6-8 weeks after surgery. Most patients can return to more normal function at about 2-3 months post-operatively, but maximum improvement can take up to 12 months. Recovery time varies among patients. What can I do to improve my results? Adequate nutrition intake is important during the healing and recovery process, especially vitamin D and calcium. Vitamin C has been shown to reduce the risk of nerve pain and complications after distal radius fractures (500 mg by mouth for 2 months). If you smoke, eliminating tobacco use will decrease your risk of nonunion, delayed healing, and infection. Hand therapy is often important in order to regain range of motion and strength. The physicians at the Raleigh Hand Center work closely with on-site hand therapists. No surgery is risk-free. However, the risk of major complications from distal radius fixation is low. Possible complications include pain, bleeding, infection, swelling, stiffness, nonunion, malunion, implant-related tendon irritation, hardware failure, and damage to the surrounding nerves and blood vessels. A fracture which fails to unite is known as a nonunion. A fracture which heals with deformity is known as a malunion. Other complications are also possible but are uncommon. Some distal radius fractures are related to reduced bone density or osteoporosis. Most people with osteoporosis can decrease their fracture risk with lifestyle changes and medication. You should also discuss the possibility of having a bone density scan with your primary care physician. The material provided on this site is intended for general information only and does not constitute medical advice. This site does not replace direct evaluation by a physician. The video is provided by the American Society for Surgery of the Hand.